It’s September already (how on earth did that happen?!) and the countdown to Christmas will soon begin in earnest, the season for mulled wine, mince pies, mistletoe and of course, the “not to be missed” office Christmas party will be on us before you know it! If you find yourself in charge of organising the highlight of any corporate social calendar, no doubt you will want to make sure it’s festive cheer and conga lines all the way! 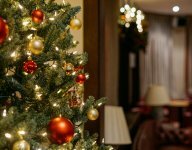 We know you will want to avoid Christmas party hell: skulking round the office with a plastic cup of flat bucks fizz, nervously avoiding eye contact with your boss/ that weird guy from HR/ the drunk girl in the corner who’s singing “Fairytale of New York” oh so badly, so here’s our handy 10 point guide to ensure your office Christmas party goes with a bang. It may feel like you’re only just dusting off your onesie ready for the winter, but the best venues get booked up…fast. You don’t want to be left with your dodgy local pub as your one and only option. 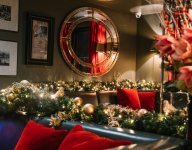 We are already fully booked on some popular dates here at Beaufort House, so make sure you get a date in everyone’s diary as early as possible, and then give us a call to secure the perfect Chelsea Christmas Party Venue! No one wants to spend their office Christmas party in the cramped office break room, with a sad radio pumping out Cliff Richard Christmas “hits” in the corner. Here at Beaufort House Chelsea we are the ideal Christmas party venue, suitable for groups of 10 up to 300 people, on the popular Kings Road. No party is complete without a theme to tie it all together. Here’s your chance to get creative. Perhaps it’s “Christmas past”, or something simply like novelty hats or Christmas jumpers. 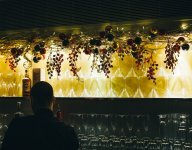 Or you could go all out and plan an activity to really get everyone involved: a murder mystery experience dinner or wine tasting or cocktail masterclass – whatever you choose the Beaufort House Events Team are here to help. Whether it’s ‘best Christmas jumper’ or ‘best achievement of the year’, everyone loves a competition and it’s a fantastic ice-breaker. You could even take it a step further and include the competition as part of your theme. Stage a full-blown quiz complete with novelty prizes and really get people excited. The options to make this the best Christmas party EVER are endless! Whatever you do, remember to include enough food whether your Christmas Party takes place at day or night. Drinks will be flowing, and no-one wants to find themselves stumbling in the gutter at the end of the night. Find out your budget and you can choose from nibbles, canapés, bowl food or a sit-down dinner. At Beaufort House Chelsea we can accommodate all levels of budget, and can create the ideal menu for all. You and/or your boss should greet your guests at the door and make sure they know where to put their coat and get a drink. This is a great way to put people at ease, as well as making the team feel valued and special when they arrive at their Christmas Party. With large groups of people this is the best way to ensure everyone is happy, and you could even mix up teams and help people socialise more. Another option is to get all the men to move seat before pudding. As well as the traditional cracker jokes, you could leave a fun ice-breaker question next to each placemat to help things along and get conversation flowing. Music is all important, and whilst you may want a few of the Christmas classics, make sure you have some tunes to cater for every taste and get people up and dancing. Perhaps there’s a secret DJ in the company, or you could even introduce a karaoke machine, our Events Team at Beaufort House can also help you with DJ or live music recommendations. So there you have it. Follow these tips and you’re all set for a fantastic office Christmas ‘do’. Just whatever you do, don’t do shots with the interns, or in fact don’t do shots full stop! (ok, well maybe just one or two!) And remember, your boss is NOT that attractive in the cold harsh light of the day after the night before!